knowledge through a video series. He originally came to us looking for a San Diego SEO company with random ideas, we helped turn those concepts into reality. Counterflow Marketing allowed me to successfully launch my own golf coaching business. With a new website and great SEO, new students started flooding in. Now I can share my love and knowledge of golf with fresh faces. Thank you to Geoff and his team. Brand Creation – Mike Wydra was a well-established golf coach, but in the college world, not necessarily in the private sector. Having been a coach for so long it was easy to showcase all of the knowledge he had, but we needed to help him reach the demographics that still didn’t know he existed. By giving him a logo and putting him on the digital map we were able to help showcase everything that Wydra already had which was a passion for the sport and a sincere desire to help individuals achieve their golfing dreams. Web Development – The biggest part of making Wydra apart of the digital world was making him a website that helped to showcase his brand and advertise his skill set to the world. Because we are a San Diego SEO company we wanted to make sure that through this website, any future student of his would know the Mike Wydra experience. By utilizing videos and testimonials viewers are able to distinguish between what it would be like to work with Mike, and even sign up for any of his services right there. By developing a site that is easy to navigate and showcases his skills Wydra is able to advertise the most important part of his brand, which is himself. Videography and Photography – In order to make this site we needed professional quality photos and videos that showed Wydra working with his students. We went out and took these ourselves and over a couple days shot a series of 10 videos that helped to showcase his knowledge. While Wydra was the one with the golf knowledge and scripted the videos, we made him look good doing it. With all of these shots being outside it was imperative that we used the environment to our advantage. After shooting the videos we edited them and showcased all of Wydra’s best points. SEO – Another major factor for Mike now that he was online, was that he needed to be found online. As a San Diego SEO company we knew that having Torrey Pines golf course in La Jolla there were tons of instructors marketing to his key demographic, but they don’t have the pedigree Wydra has. 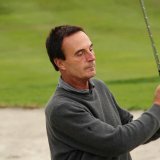 We took advantage of that and optimized his website so that anyone searching for golf lessons in the area saw him first. By doing this we were able to make him the first in his industry and easily quadrupled his revenue. Our favorite projects are the ones that we know will directly help someone in our community. We are so glad that we were able to help Mike Wydra with this in such a huge way. Through our work with Mike Wydra we were able to show our local community a quality service that they were missing. We did everything we could to make sure that Wydra would be a success, and it worked. By creating a clean, informational and user-friendly site we were able to broaden the number of people that he was reaching which ultimately saved his career. Not even the most photogenic take perfect photos. We took beautiful San Diego golf courses and someone who is clearly extremely passionate about what he does and made sure he looked the best he could doing it. We made sure to know the essence of who Mike Wydra was and the service he provided before we tackled his brand and website. This enabled us to create a design that was perfect for his brand and his customer.